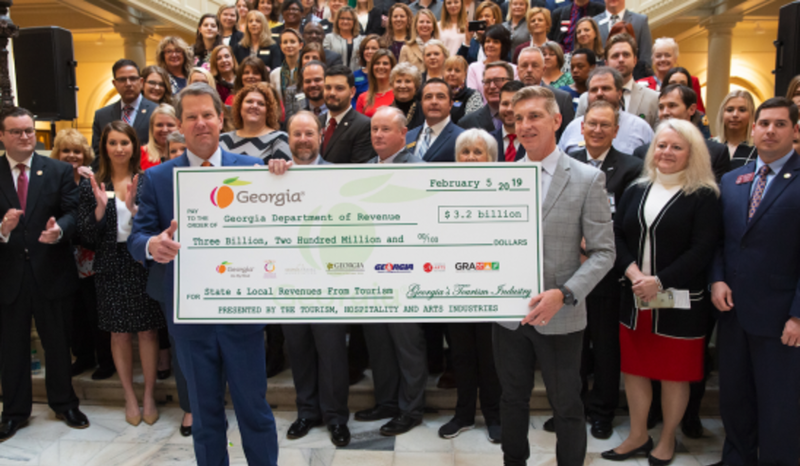 ATHENS, GA (Feb. 8, 2019) – Tourism and arts professionals from Athens joined Governor Brian P. Kemp and other professionals from across Georgia for the annual Tourism, Hospitality & Arts Day at the Capitol on Tuesday, February 5 to recognize the record-breaking $63.1 billion impact on Georgia’s economy. The Athens Convention and Visitor’s Bureau (CVB) Director, Chuck Jones and the Athens CVB Director of Marketing and Communications, Hannah Smith, were joined by Michael Lachowski from the Georgia Museum of Art and Elizabeth Hovell from the Georgia Center for Continuing Education to represent the Athens area. The state&apos;s tourism industry generated a record-breaking $63.1 billion in economic impact in 2017, for an increase of 3.8 percent over last year, according to the U.S. Travel Association and Tourism Economics. Leaders in the industry presented Governor Kemp with a check representing the $3.2 billion in state and local tax revenue generated by tourism-related expenditures in 2017. For Athens-Clarke County, visitors generated a total of $310.17 million in spending according to the “2017 Travel Economic Impact on Georgia State, Counties and Regions” study prepared for the Georgia Department of Economic Development (GDEcD) by the United States Travel Association. Tourism in Athens-Clarke County supported 2,872 jobs with a $310.17 million payroll, as well as $21.24 million in local and state tax.